Enthusiasts that work on their own cars and are yet to use jack stands are taking a big risk. Your standard floor jack will withstand the weight a vehicle but if there are any sudden movements, there is potential for the jack to slip with you underneath. The best jack stands is the ESCO 10498 Jack Stand, which adjusts from 13 to 21 inch and are powder coated to prevent corrosion during their lifetime. Jack stands offer much more safety compared to other alternatives such as spare wheels, ramps and trolley jacks. If you are doing any major work underneath your car such as transmission, suspension or oil changes, safety should be paramount. 7.5 How to use Jack Stands? When choosing jack stands, it is always recommended to purchase them in pairs and avoid mixing and matching brands as you will want to ensure your car is balanced. In terms of the pricing, you will be forced to pay extra for a heavier weight rating. The maximum weight capacity is usually around 10 tons and anything higher will need to be tailored, which will be seriously expensive. There are various designs and feature you can get with jack stands these days and its worth researching. Below is a list of the best jack stands for cars that will increase the safety whilst you are working underneath it. The ESCO 10498 is a premium heavy duty jack stand that adjust from 13 to 21 inches, which is more than enough room to work underneath a car. Each stand includes a rubber pad to prevent scratching the paintwork and the stand itself is powder coated so that they do not rust. They are sold separately and can be bought in a pack of 4 but this brings us round to the only drawback of these jack stands. They are more expensive than the alternatives but in return, you are getting the best jack stands you can buy. If you are worried about the jack stands slipping, the ESCO 10498 use circular base pads for maximum stability. They are very solid and hold up to 3 tons of weight, which is more than enough for the majority of cars. Overall, it is the best jack stand you can buy and the 3 leg construction is preferred for stability over the other 4 leg alternatives. Torin are a huge brand in the garage equipment scene with a tool for virtually anything. The jack stands are sold in pairs with a 6 tonne capacity each. For maximum safety, included is a double locking mechanism that Torin say increases safety by up to 200%. In terms of the adjustability, they will rise from 15-3/8 to 23-13/16 inches and meets all ASME safety standards. They are a four leg construction and have a large foot base to prevent any movement. Torin offer a 1 year limited manufacturer warranty with these jack stands for piece of mind and overall, they are the best jack stands for the money. They are sold as a pair, which makes them much more affordable than the ESCO model above. For those that need more room whilst underneath a car, you will want an extra high jack stand. Sunex offer three versions of their 10 tonne jack stands with a low, medium and high height range. The highest will reach a max height of 46.5 inches with an easy adjustment that using a pin to lock the height in place. In terms of the adjustability, the lowest setting is 28.1 inches and it will raise all the way to 46.5 inches. The additional room can make all the difference when working underneath a car, for example trying to remove a gearbox with limited space can make the job 10 times harder. Overall, the pair are the best jack stands for trucks or heavy vehicles that require a higher weight rating. The Hein-Werner jack stands are US made heavy duty examples that are height adjustable by using the multi-position ratchet bar. However, it only adjusts from 12 1/8 to 19 inches but this can be done whilst the car is on the stand. As far as the construction is concerned, the top of the stand is curved, which results in extra stability under the frame and this jack stand also has wide base at 7.5 x 9 inches. The width is great for stability but if space is tight, it may become an issue. Overall, they are a great pair of heavy duty jack stands that is rated at a 3 ton capacity. They are more expensive than many of the alternatives but the solid construction is worth paying the extra for. The OTC 1780 are heavy duty jack stands for large vehicles due to the huge 22 ton weight capacity. If you are worried about working underneath your truck with your current jack stands, these are ideal and meet all US standards for lifting equipment. For stability, the base is completely flat with a large support area for heavy loads. There is only 3 adjustments of height, which are adjusted in 3 inch increments to a max height of 20 inch from the smallest collapsed height of 12 inch. Overall, they are the best jack stands for trucks and any mechanic working with heavy loads. Safety is critical when working underneath a car and if you are working with a car heavier than the weight capacity, you are putting yourself at great risk. Simply relying on your trolley jack to withstand movements and the weight of your car is not exactly safe. Trolley jacks should be used with caution because if there were to be a sudden movement, it will cause the car to fall on top of you. If you have been using spare tires to add a small amount of safety whilst under the car, now is the time to get yourself a decent set of jack stands. In recent years, the features and materials used have been better with many including adjustability. Below are some factors to consider before jumping at the first pair you find. There are various types of jack stands, which include a ratcheting mechanism, pin type system and a static stand with no height adjustment. The ratcheting mechanism is great for small tweak in the height, however they are prone to reliability issue from long term usage but only if you purchase a cheap version. Pin types is an old fashioned but safest type of stand that will not fail. Often found with high weight capacity jack stands because the steel locking pin will withstand heavy loads easily. Of course, you do have the issue with adjustment of the height taking much longer than the ratcheting style. Finally, the older static height jack stands were popular many years ago and are much cheaper. However, if you are planning on working on cars or planning on lifting the car for long periods of time, this may become an issue if there is not enough height. If the main purpose is storing cars for long periods, you may be better to use car dollies, which will allow you to move the cars more easily too. Depending on the budget you set for a pair of stands will determine which material it will be. The majority are made out of heavy duty steel but premium examples will use aluminium as they it is stronger, lighter and more resistant to corrosion. Quality of the materials isn’t all you should look out for. The weld of the materials is crucial because you will want to ensure it doesn’t bend or crack when you have your vehicle on the stands. In terms of stability, the base width and number of legs are the main factors. A wider base will increase the stability but it can also be harder to use in tight areas. A pyramid base is the most stable design and used by many of the top rated brands. As with trolley jacks, each brand differs with the weight capacity ratings with some only offering a maximum of 3 tons to others such as the OTC 1780 offering a staggering 22 ton weight capacity. Many people confuse the weight ratings as the rating per stand. This is wrong because all jack stands are rated as a pair and this is stated by the ASME safety standards. If you know you will be working on heavier loads in the future, it is always worth going for the highest weight rating. Jack stands are an investment because they will last a lifetime if you use them for their intended purposes. In order to work on certain vehicles, the jack stands may need to be adjusted in order to deal with the additional ground clearance. This can be anywhere from 10 to 50 inches in some cases in order to get the vehicle safely off the ground. Of course, there is a limit to how high you can go and the higher the adjustablility, the more expensive the jack stand will be. If the height is far to great for the stand, the only alternative is to purchase a car ramp or if you have a large garage, you can get a 2 or 4 post garage lift. How to use Jack Stands? Firstly you need to decide if you are using just a single jack stand or planning on supporting the front or rear axle or the full car. If you are using more than one jack stand, you will need to adjust the height so that they are all equal. Once equal, you can then use a trolley jack to lift the car in the air. Once lifted, place the jack stand under a solid structural piece of the vehicle frame. If you are struggling to find such an area, refer to the vehicles owners manual. You will need to repeat this process for each axle as it is too risky to put the car very high in the air to do all 4 corners. Once all the jack stands are put into place, be sure to test them out. To do this, give the car a small push or shake and make sure there are no movements from the jack stands. If you want to take safety a step further, you can even place wheel chocks to increase the stability of the car. Risking your life underneath a car that you are working on using just a trolley jack is not worth it. 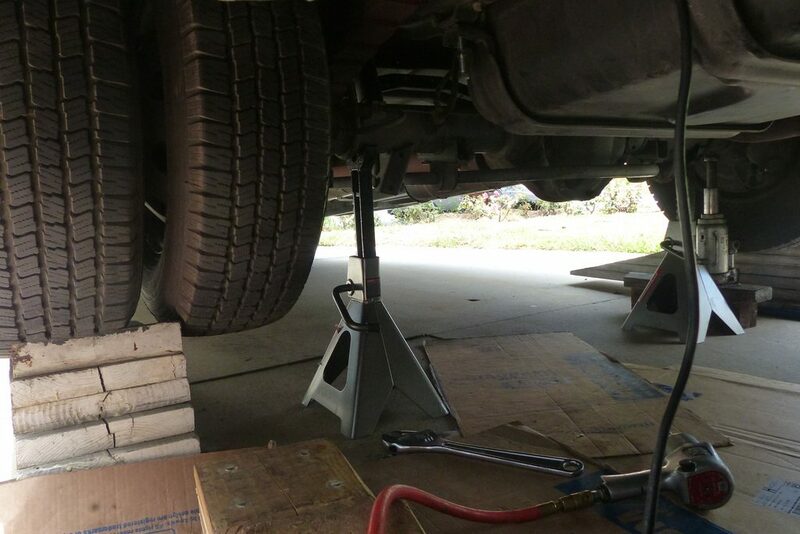 Invest into a decent pair of jack stands to add safety to your work area and give you confidence underneath the car. Cheaply made jack stands can fail, although very rare but nevertheless, paying the little extra is worthwhile.